Aikido is a Japanese Martial Art. 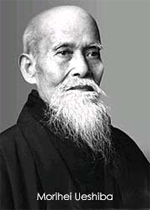 Morihei Ueshiba, also known as OâSensei, or Great Teacher, developed it. OâSensei was a master swordsman and licensed instructor of several styles of martial and fighting arts. He is often described as one of the best martial artists of all times. O’Sensei was a man of peace. He took a tradition of fighting arts, originally designed to inflict injury and death on the battlefield and transformed them into a path of Martial Arts dedicated to perfecting the human self by integrating mind, body and spirit. Aikido is a noncompetitive martial art based on harmony. It is a self-defense system that neutralizes aggression through passive methods of conflict resolution rather than resorting to violence. When we hear the term Martial Arts we often conjure up images from Hollywood of shouting, spinning, kicking and violence. It can be a misleading view of the martial arts. Martial Arts training, as it is presented at Rising Sun Aikido, is counter to what we see on TV and in movies. The Japanese Martial Art of Aikido is based on a historical perspective called Budo, “the way of the warrior.” Modern Budo teaches that violence is not an appropriate response to violence. Saotome Shihan (a title meaning Master) says that, “the purpose of Aikido training is not to create aggressive fighters but to refine wisdom and self control.” In Aikido we train in the spirit of benevolence, wisdom and courage; we do not train in an atmosphere of combat or competition. Physical training in posture, footwork, body position, timing, distance, force, speed, spatial relationships and direction.